You can save and restore the program settings easily by using program feature to save\load the settings to\from a file. In order to save settings: open the main program options and click to the "Options" button, then click "Save To File..." in the drop down menu. Then specify a path and a file name in the opened dialog to save settings to it. Use the similar way in order to restore the settings on another computer by using "Load From File..." command in the same drop down menu. USB Safely Remove also supports command line parameter /loadsettings that allows you to restore settings from a script / batch file. This might be useful when you need to install the program on many computers and you created a special script / batch file for it. 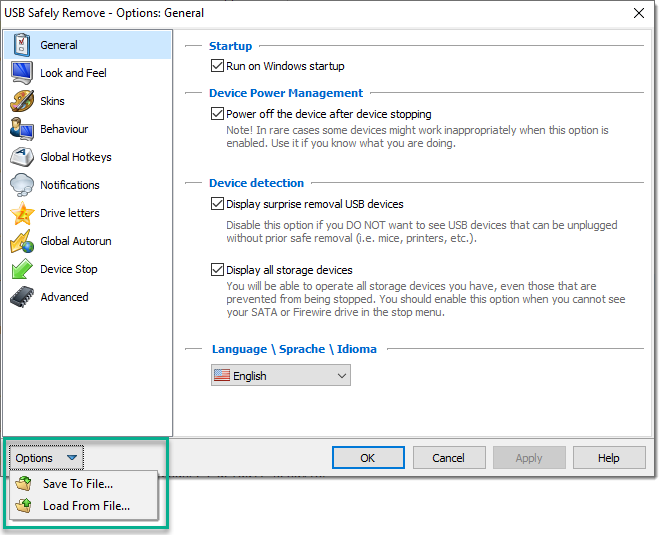 Where <usbsr_settings.opt> is the settings file name you are restoring program options from. Your license key is also stored in the settings file! So be careful, avoid accessing your settings file by other people. If your license key is found on the Internet we will have to block it. At your wish, you can exclude the license key from the settings file. To do it see the section below. The settings file has simple INI file format, which is a plain-text file containing sections and parameters with values. Thus you can delete unnecessary to restore options (e.g. the license key) using a plain text editor.